One of the older courses near the city center features lots of water, attractive layout and big & mature trees. Completely rebuilt in 1994 by James R. Vaughn. This is actually a very demanding test of golf, especially if youre not hitting it straight. Most holes feature water and/or Out of Bounds on both sides of the fairway and the greens are deceiving and somewhat difficult to read. The Par 4 1st can ruin any chances of a good score very quickly, and the Par 5 2nd is equally difficult with a narrow fairway and water hazards on both sides. 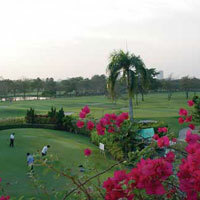 There are significantly more mature trees than most other courses in Bangkok, and combined with several tight driving holes, Krungthep Kreetha can frustrate you as much as any course. Close to the city,or actually in the city, but if you don't take the right way you'll end up taking an hour to get there anyway so it's important to know which way you're going. Personally we don't like courses that have 10 yards of fairway and water on both sides, but if that's your thing, then this could be for you. Not that bad, but just doesnt do it for us.